Hey guys, we have some big news to share... Meet Eleanor! We recently purchased a 1986 Jeep Grand Wagoneer, after years of saving up for a larger, more durable road-trippin’ vehicle. Eleanor has quickly become an important part of our vintage family. She is an old soul but still has a lot of life left in her. Eleanor made her way north from New Mexico and serendipitously ended up at a car dealership in Stillwater, Minnesota. We found the craigslist ad and decided to go scope it out after a late dinner in the area, when the dealership was closed. We peered through the tall windows like kids looking into a toy store on Christmas Eve. The Jeep was on display in the center of the showroom. 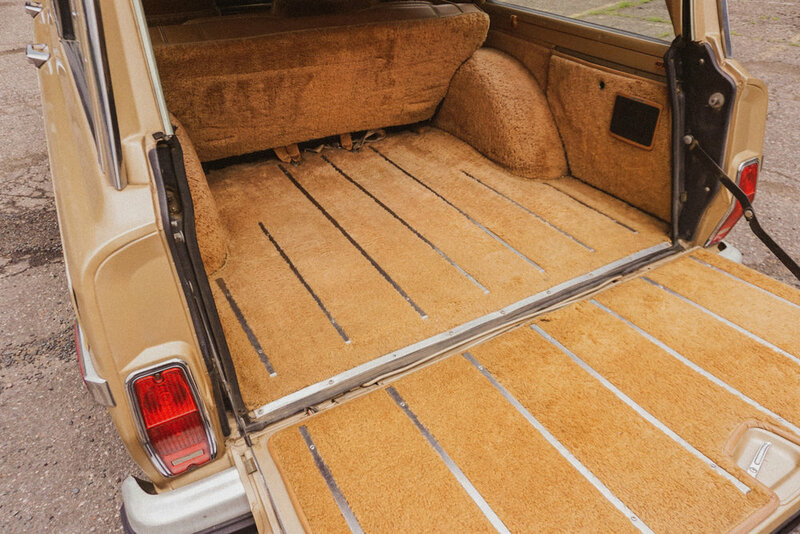 The wood paneling and trim looked to be in good vintage condition and we couldn’t wait to set up an appointment to look at the Wagoneer up close. We did so two days later and ended up purchasing it within a week! It was definitely one of the craziest purchases we've ever made for Moth Oddities but once we saw what great condition it was in, we knew we had to act fast. When we purchased the Jeep it had about 125,000 miles. It runs on an AMC 360 V-8 engine, has power locks & windows, new tires, retro carpet throughout and a sweet cassette player for all those vintage tapes we collect from thrift stores. Purchasing the Wagoneer was also a big step towards our goal of becoming a mobile shop! Eleanor has 4-wheel drive and a great towing capacity. These features will come in handy when we find that perfect camper to outfit into our mobile vintage shop. Looking forward to future adventures in this wood-paneled beauty. Thank you to all of our friends, family, followers, customers and collaborators! Your support over the years has kept this vintage dream alive. P.S. If you have any vintage camper leads, old car wisdom, or questions about Eleanor, please share in a comment below.